Dramatic CCTV footage shows the moment storekeeper Shikha Mahsum blasted a gunman in the face with an animal repellent spray. 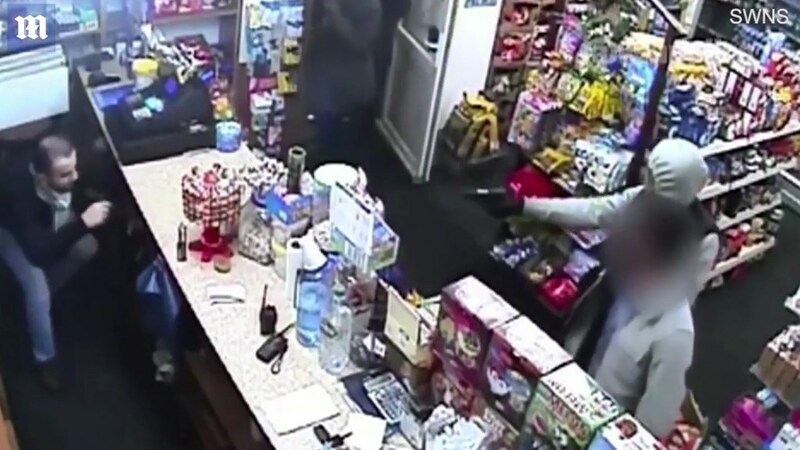 The fearless shop owner described hearing the attacker’s gun ‘click’ but failing to fire as he faced down the raider. He first pointed the weapon at the head of another staff member before waving it in Mr Mahsum’s face, over the shop counter. But the quick-thinking shopkeeper, who took two bullets fighting Saddam Hussain’s troops in Iraq, grabbed the spray from under the counter. Weapons-trained Mr Mahsum then blasted the gunman directly in the face, before chasing the would-be robber out the door of the shop in Walsall, West Midlands.